If you’re a man over the age of 55, you’ve most likely harbored a dark secret from an early age. It’s probably still your secret: you wanted to be a cowboy. Maybe even a gunfighter, a U.S. marshal, or a bounty hunter. For you, and generations of men who grew up on western movies spiced with shoot-’em-ups and posses on fast horses in dusty pursuit of The Bad Guys, the town of Deadwood, South Dakota, exerts a powerful magnetic force almost impossible to resist. Don’t fight it. An estimated 1.5 million visitors pass through the town of fewer than 1,500 fulltime residents annually. Prepare to be a tad disappointed, though. To put that in some context, Deadwood started life illegally in 1874 when gold was discovered in the Black Hills by troops under command of Lieutenant Colonel George Armstrong Custer. Two years later, thousands of fortune-seekers swarmed into land granted by treaty to the Lakota and Cheyenne people. Ironically, it was the displacement of the natives that led to Custer’s death at Little Bighorn in June 1876, but that’s another story. The town’s heyday as a crossroad for gunfighters, gamblers, and prostitutes lasted for less than a decade. That’s it. That’s what the legends, myths, and movies have been all about. By the 1980s, the tourists had been there and done that. In 1989, to pump some life into a tiny hamlet teetering on the edge of its own Boot Hill, the powers that be hauled in what now amounts to about 5,000 slot machines and gambling tables. And that’s what Deadwood is today. Dress it up in whatever you want, but it’s all slightly sleazy with the incessant bells, whistles, flashes of light, and sound effects having elbowed aside the era of the Wild West in favor of convenient cash. But wait — you can’t discount Deadwood’s importance to the American cultural and historic fabric. Remember, this is a state where cowboy hats, boots, and shirts are not costumes, where Wild Bill Hickok made much of his living with a gun and the poker table, and where much of today’s population is licensed to carry a gun. The Western drawl you hear in the movies is probably hereditary and so is the dry sense of humor. So, there is history to be found. James Butler Hickok (“Wild Bill”) was shot in the back of the head August 2, 1876 while playing poker and holding a hand of aces and eights, forever after known as The Dead Man’s Hand. Along with Hickok, the colorful array of characters hanging out at the time included Martha Jane Canary, a tobacco-spitting, beer-guzzling, foul-mouthed woman who preferred men’s clothing to dresses. She was well known through the Hills as Calamity Jane and thought of herself as Wild Bill’s girlfriend. There were also Seth Bullock, Potato Creek Johnny, Colorado Charlie Utter, Al Swearengen, Poker Alice Tubbs, Solomon Star, and others. The best place to meet them today is in the Mount Moriah Cemetery, where a statue of Wild Bill dominates a high spot. Wyatt Earp and Doc Holliday most likely spent some time in Deadwood and it’s also likely the Sundance Kid passed through because Sundance, Wyoming, where he spent time in jail, is 47 miles away. If you admire the rugged nature and stubborn determination that built the U.S. West and Midwest, Deadwood is a worthwhile vacation destination. Here, you escape the glitz and bustle of the big city and quickly begin to appreciate the wide-open vistas and clear skies. For what you might regard as a remote region, you will find at least a dozen notable attractions within easy drives and most will be connected by breathtaking mountain scenery and cool air laced with the scent of cedar and pine. A brief conversation I had the last day of my stay hinted that the spirit of the Old West may still be lurking in Deadwood. A good source of Deadwood history can be found at https://www.deadwood.com/history/. There is no shortage of accommodation in and around Deadwood (check https://www.deadwood.com/lodging/). The same is true of eating establishments (https://www.deadwood.com/wheretoeat/). There are numerous events ranging from rodeos to musical concerts throughout the year. But visitors should be aware that Deadwood doesn’t provide much in domestic services, so shopping for groceries, clothes, vehicle rentals, or even a full-service liquor store will require a trip to Spearfish 20 minutes away. Additional information is available by requesting a brochure at https://www.deadwood.com/aboutdeadwood/requestabrochure/ or by calling 1-800-999-1876. If Deadwood itself is a little short of drama, the immediate area is rich in tourist opportunity. If you want to do it all, three days won’t be enough. Mount Moriah Cemetery/“Boot Hill,” just northeast of Deadwood. Wild Bill’s grave site at Mount Moriah is the most prominent and visited by thousands each year. Calamity Jane, a character known as Potato Peel Johnny, and a famed clergyman, Preacher Smith, are among the personalities buried here. Mount Rushmore. This famous national monument honors four U.S. presidents: Washington, Jefferson, Theodore Roosevelt, and Lincoln. 48 miles from Deadwood. Crazy Horse Memorial. Destined to become the largest statue in the world, this mountain carving was started in 1948 and is still a work in progress. Crazy Horse, probably the driving force behind the Sioux victory at Little Bighorn, was chosen to represent all American natives. The site is eight miles from Mount Rushmore. The Needles Highway. Breathtaking drives would be incomplete without The Needles, 69 miles from Deadwood in Custer State Park. As with many roads in the Black Hills, small herds of young deer cross your path regularly. From personal experience, my advice is to drive slowly and with vigilance. Wall Drug. Wall Drug is one of those anomalies that makes no sense. Immortalized in a few books, the company is masterful at marketing, first having put up hundreds of signs all over the American Midwest and West: “Only 321 miles to Wall Drug,” “Only 43 miles…,” etc. 93 miles from Deadwood. The Badlands. 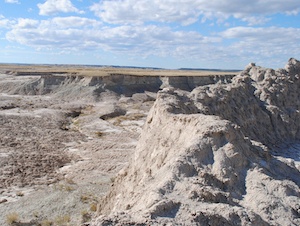 The Badlands (112 miles) are a bright, alkaline gray with dusty and bleak hills of eroded rock. The Badlands have a dramatic history; as a sacred site, they were the location for the Sioux “ghost dances” designed to make the white man disappear.